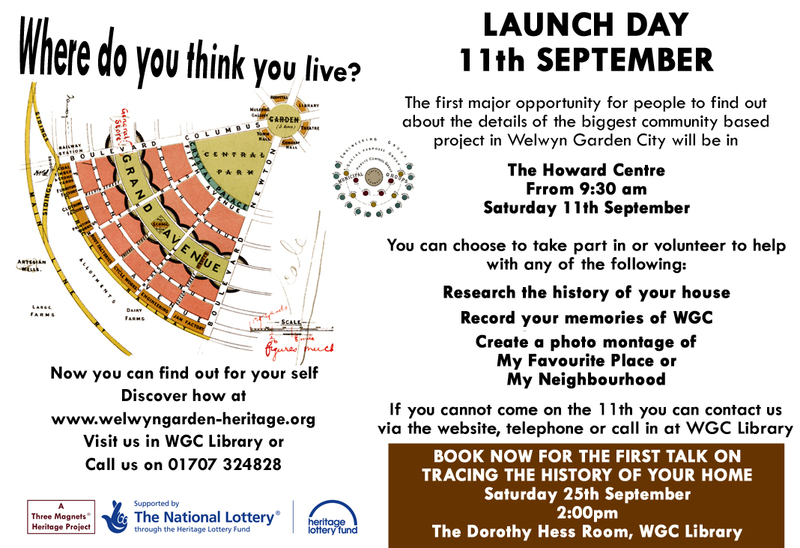 You are here: Home>History of Welwyn Garden City>The History of Welwyn Garden City>Where Do You Think You Live? Saturday 11 September is the launch day for a new project about Welwyn Garden City: Where Do You think You Live? The project, managed by the Welwyn Garden Heritage Trust and supported by a grant from the Heritage Lottery Fund, will be an opportunity for homeowners to research the origins of their homes. Working with Hertfordshire Archives and Local Studies (HALS) the Trust will offer workshops and study visits to the County Archives in Hertford to enable people to learn how to research stores of information. The sort of data which the project is hoping to unearth is the date when the house was built, who was the architect, the builders and who has lived in the house since and anything else special about the place where it is. The first event will be a talk on ‘Researching the History of Your House’ by County Archivist, Sue Flood. This will take place on Saturday 25 September in the Dorothy Hess Room at Welwyn Garden City Central Library. Running alongside the research part of the project will be an expansion of the ‘Thanks for the Memory’ programme of audio recordings of residents’ recollections of their early days living in WGC. The funding available from the HLF grant will enable recordings to be typed up and the Trust is planning to recruit an oral history specialist to help develop the programme and make the original recordings and the text versions more accessible to the general public. The third arm involves photographic projects by school pupils with the title ‘My favourite place in WGC’ or ‘My Neighbourhood’ which can be developed by a group of residents to show the rest of the town what is special about where they live. To assist anyone wanting to get involved the Trust is planning workshops for old and young alike to improve their skill is using digital cameras. The town’s junior schools will be invited to get involved in some designs based on one of the odd features of some houses in the older parts where the bricklayers have created pictures the size of a single brick in the walls. Both these ideas will be supported by an Artist-In-Residence employed by the Trust. The whole project will link to the Our Welwyn Garden City website and is supported by the involvement of the University of Hertfordshire’s Humanities Faculty, which has a very active local history unit. This page was added on 08/09/2010.